A study of the Hynes family of St Brendan's Newfoundland. What thoughts must have passed through the minds of those who left behind the places of their birth to settle this new land and continent that we, their descendants now call home? What fears, hopes, dreams? Students of history that we are, we can today look back and see all manner of reasons they may have left, may have chosen or been forced to abandon the known for the unknowns that North America and the new world offered. The reasons to leave Ireland were as many perhaps as the numbers of people who did make the crossing of the Atlantic for places like the United States, Canada and Newfoundland. This, and these pages are given to them, those of the past, who through their courage and perseverence made today possible for myself, and mine. Learn more about the Hynes family history and origins by visitting the Hynes Clan Pages an ongoing and fascinating study into both the past and the present state of the name and clan. 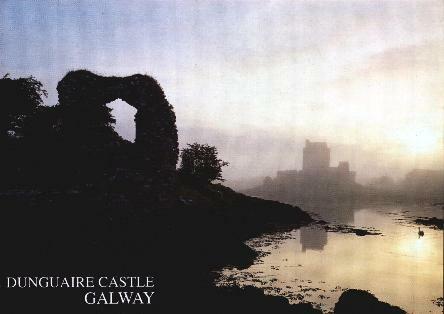 Through the mists, and reflected on the water we see the tower of Dunguaire Castle, County Galway, Ireland the historical home to those of O'Heyne blood. True, we can find Hynes' and Hines', Hinds, and Haynes in many another place in Ireland and Britain, but nowhere are they as seated as they are in Galway where the roots of the tree were first seated. Before any more is or can be said here I owe thanks to those who over time have aided me in my research of my family roots, without them, and without the help they offered none of this really could be possible. Who many years ago, helping me through a high school history project gave me not only the first of my data but also instilled in me an interest in discovering more that remains to this day. A cousin from the maher side, who not only rekindled the interest, but took it on herself to start to draw back together family that had grown too far apart in too many ways. We're cousins though distant ones, but Helen, as much as anyone has taught me what little I know of St Brendan's. I'm not sure just what our blood connection might be, but again, a teacher to whom I am and will forever be grateful. Cousins in more than one way, Bert did much of my initial research as well as clarifying some of my earliest questions. Whom I have just come to meet recently, again a man with a fine memory who's already cleared up some questions. The countless web pages browsed and contributors to each, works of love for the most part for which most don't expect thanks, but tis work indeed they do, and thanks they deserve. And of course, to those I've pestered with emails, far too many to mention here, but never the less integral parts of this project. 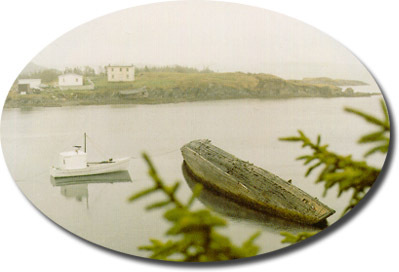 The ultimate place to begin any Newfoundland search, be it for your roots, or merely to discover and learn the history and settlement of Canada's youngest province. I would dearly love to be able to speak with Mr MacKey so if anyone has an address for him of any type please forward it to me.